Which bottle turned you on to white Burgundy? Name, rank and number. Mine happened to be one of the most elusive and expensive bottles in existence. It must have been circa 1998 when I was working as an employee of a Japanese importing company, learning the ropes and training my fledgling palate. We dealt with a Dutch merchant and I had flown over to barter down prices for our monthly mail-order catalogue, after which we dined at a local restaurant for obligatory mussels and pommes frîtes. Towards the end of the evening, in strode my host’s brother having driven directly from the Côte d’Or. He wore a Cheshire cat grin and brandished a bottle that he insisted I taste because it was so special. I read the label. He asked if I was familiar with d’Auvenay. I shook my head. He mentioned Lalou Bize-Leroy and I just sat there with a blank expression on my face. Who? As I said, I was still learning who the gods and goddesses of the wine world were. I took a large sip. It was like a thunderbolt hitting my senses: the tension, the complexity and intensity sent shivers down my spine. It was difficult to put down in words, yet this wine became instantly and indelibly etched onto my brain. Now I understood why oenophiles genuflected at the altar of white Burgundy. “You’re unlikely to ever drink it again, so enjoy it,” he advised and generously topped up my glass. And you know what? He was right. After that night I only drank d’Auvenay wines in maybe two or three occasions over many years and yet I would never forget that epiphany. Fast forward nigh on 20 years and I am on vacation visiting friends in Hong Kong on the cusp of a wine tasting that exists on that liminal point between reality and impossibility. But it is happening. One of its members is a lovely fellow with impeccable taste and certifiably obsessed with Domaine d’Auvenay. I reckon his bedroom wall must be plastered with posters of Lalou Bize-Leroy posing amongst her vines with a pair of secateurs and her yapping dogs. This gentleman, who I shall give the nom de plume “Mr. d'Auvenay”, spent many years traveling to Tokyo on business, where he would drop in at Takashimaya. This well-known Japanese department store was and still is a shareholder in Mme. Bize-Leroy’s company and unsurprisingly their main store boasted an array of d’Auvenay and Leroy wines. Mr. d’Auvenay told me back then these wines were expensive, but far from their current astronomic price tags. This evening he planned to share some of his collection with friends and to make it extra special, the bottles focused on d’Auvenay’s Grand Crus: Chevalier-Montrachet, Bonnes-Mares and Mazis-Chambertin – wines so rare you fear the entire production could evaporate merely by mentioning their names. We should briefly remind ourselves of the backstory. Lalou Bize-Leroy inherited the Domaine d’Auvenay with her sister upon her father’s passing in 1980 and then bought out her sister’s share in 1990, the same time as she was establishing Domaine Leroy following acquisitions of vineyard holdings from Charles Noëllat and Philippe Remy. No doubt the investment of Takashimaya allowed her to do this with alacrity, rapidly accumulating enviable parcels of vine. Domaine d’Auvenay is based at her former hunting lodge and home just outside St. Romain; a picture postcard property lost amongst a glade of trees where she lived with her late husband Marcel. Lalou expanded the holdings piecemeal so that there is now just under four-hectares under vine split between 16 different appellations (including the most recent acquisitions in 2011). These range from Bourgogne Aligoté up to five Grand Crus. Let’s look at how Lalou was able to assemble these holdings. The parcels in Meursault and Auxey-Duresses inherited from her father formed the nucleus of the domaine and were kept separate from those belonging to Domaine Leroy. These were augmented by several acquisitions, starting with 0.51Ha of Puligny-Montrachet 1er Cru Les Folatières in 1989 and the postage stamp sized 0.064Ha plot of Criots-Bâtard-Montrachet Grand Cru a year later. The domaine’s jewel in the crown, 0.163Ha in Chevalier-Montrachet Grand Cru was added in 1992. Jean-Michel Chartron told me his father had to sell a few rows after his own father passed away. Chartron kept the Clos des Chevalier monopole, while a few rows located to the left of their parcel as one looks up from Puligny were sold to Lalou. 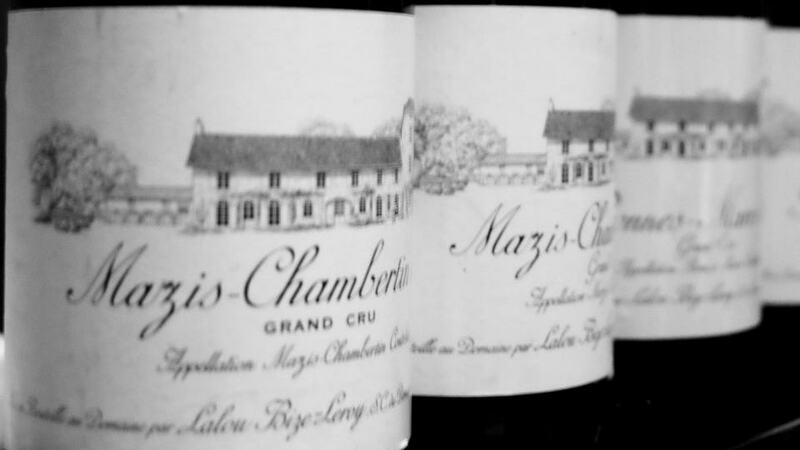 The following year Lalou bought 0.26Ha in Bonnes-Mares Grand Cru (although I do not know the seller) and in 1994, the Collignon family, from whom she had been buying fruit for many years, sold her their 0.26Ha parcel in Mazis-Chambertin Grand Cru. There followed a long break before Lalou added a fifth Grand Cru of Bâtard-Montrachet that came with a plot of Puligny-Montrachet Les Enseignères. All these parcels are tiny. To give you an idea of their size, Olivier Lamy, whose patch of Criots-Bâtard-Montrachet conjoins those of Lalou’s once told how he spotted just three or four crates in the vineyard, sufficient to pick the entire parcel that year. I remember seeing a small stainless-steel cylinder at the winery and enquiring whether it was some kind of micro-vinification. In fact, it housed the entire production of 75-litres of the 2010 Criots-Bâtard-Montrachet. Where possible I have included the exact number of bottles produced, information that I gleaned from the back labels. Of course, the same tenets of biodynamic farming applied at Leroy are employed at d’Auvenay with a preference for early springtime de-budding rather than green harvesting, à la Mugneret-Gibourg, and little de-leafing if any at all. The winery was refurbished in 1994. Like Leroy, there is no de-stemming and the élevage is conducted in new oak, employing mainly François Frères sourced from Tronçais. We began with a fascinating three-way blind comparison of Puligny-Montrachet Les Enseignères from Domaine Ramonet, Coche-Dury and d’Auvenay, the latter from their acquisition in 2011. I thought it would be easy to nail the reductive, struck match aromatics of the Coche-Dury and the mineral-driven style of Ramonet and deduce the d’Auvenay by elimination. As it turned out stylistically they were more difficult to discern. To be honest, I was seeking more mineralité in the d’Auvenay that sported dried honey notes, possibly due to a little botrytis, shaving off a little precision. The Les Enseignères from Coche-Dury exhibited less of the struck match signature than I expected: quite fat in the mouth and again, suggestions of a little botrytis, with a precise and malic finish that was vrai Puligny. My pick of the three came from Ramonet that was focused with wet limestone scents on the nose, the very subtle reduction throwing me off the scent (literally!) but the steely finish was wonderful. All in all, three great wines from a village cru. We then went right back to the beginning, to the genesis of Domaine d’Auvenay with three examples of mature Meursault Narvaux. Forget the fact that this is just a village cru, because I have encountered brilliant Narvaux from d’Auvenay that were easily premier cru level in quality. The 1989 Meursault Narvaux must have been the first vintage by my reckoning. It had certainly lasted well, a slight algae-like scent on the nose, but tensile and maintaining respectable nervosité. The 1991 Meursault Narvaux pipped the 1989: a little richer, slightly waxy in texture with a twist of bitter lemon on the finish. Wonderful. The 1993 Meursault Narvaux was not quite in the same league, missing the same nerve as the 1991 and I was not the only one to conclude it might be two or three years past its best. Then again, it is easy to overlook that it is 24 years old. I am not sure how many can claim to have been served the 2005 Criots-Bâtard-Montrachet from d’Auvenay not once, but twice in the same year...but that is what happened. Only 182 bottles were ever made, around half a barrel or thereabouts. Great things come in small packages. This bottle replicated the performance back in London a few months earlier, maybe a little reserved and Chablis-like in style, with a long walnut-tinged finish that fanned out like there is no tomorrow. Good luck to anyone who has tasted or who might own the remaining 180 bottles. Logically, we moved on to the vertical of Chevalier-Montrachet, but I would prefer to leave that to the end and focus on the two red Grand Crus: Bonnes-Mares and Mazis-Chambertin. I concur with the view that d’Auvenay’s whites have the magic touch rather than the reds. Without wishing to traduce these two crus, I find that Domaine Leroy’s Musigny, Richebourg or Romanée-Saint-Vivant eclipse their Grand Cru counterparts from d’Auvenay. We had three mature examples from Mazis-Chambertin. The 1995 Mazis-Chambertin was ripe and showy but did not convey the same precision as the 1996 Mazis-Chambertin. The 1996s are always a little obdurate, a bit serious and this was no different, yet you could not deny the persistence and depth that should see this mature with style over many years. And whilst I am not a huge fan of the vintage, the 1998 Mazis-Chambertin was more sensual and with perfect acidity. 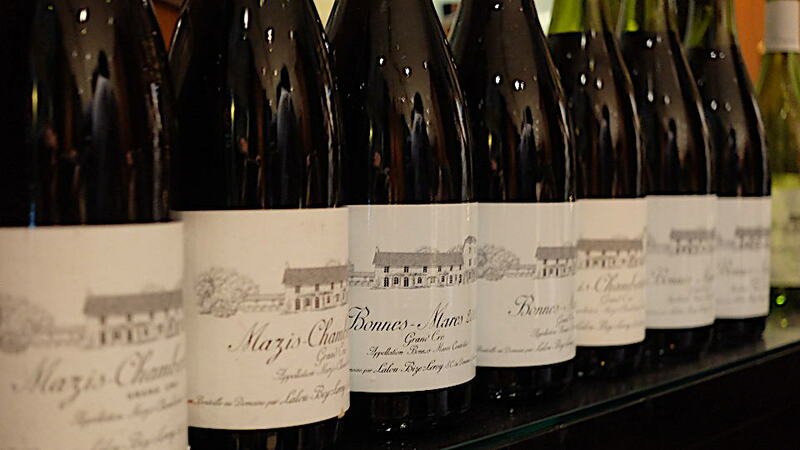 The four vintages of Bonnes-Mares were generally younger, although with at least ten years bottle age. The best were the two eldest, the 2000 and 2001 Bonnes-Mares offering the sumptuousness and extravagance you seek in this vineyard, the latter quite Mugnier-like in style with a fabulous mineral-driven finish. I was less taken with the two younger vintages. The 2003 Bonnes-Mares reflected more the heat of the growing season than the terroir, clear to see when contrasted with other vintages. The 2006 Bonnes-Mares was a bit rigid and lacked the harmony and precision of the 2000 or 2001. Maybe it just needs time? 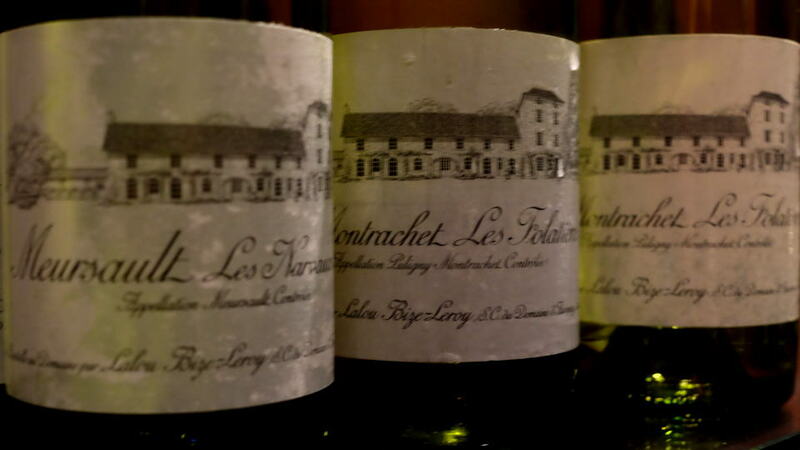 The flight of Chevalier-Montrachet, Lalou’s jewel in her crown, was the main event. You can put me on record: Lalou Bize-Leroy creates the greatest white Burgundy wines. Her equals are only Jean-François Coche and perhaps Pierre Morey. Her whites at d’Auvenay, not only at the top echelon, but also at the village cru level, so often convey something magical. Even the ludicrously priced Bourgogne Aligoté can prompt superlatives usually reserved from a premier cru. On this occasion we were presented with no less than five vintages of a wine that I had last tasted all those years ago back in Holland. 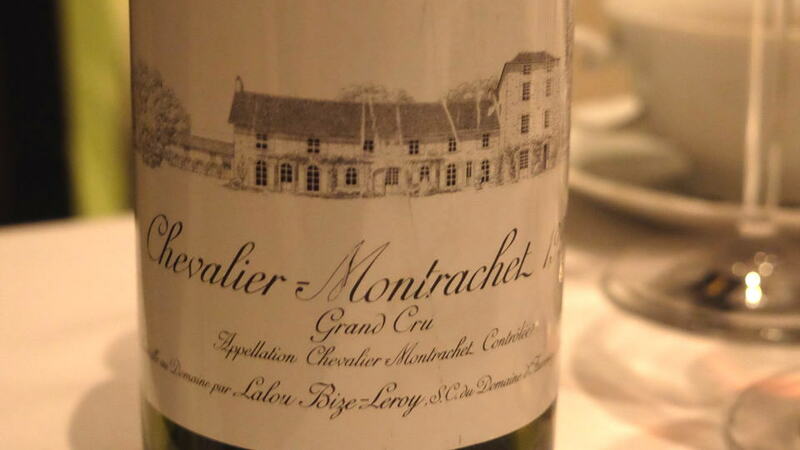 The 1993 Chevalier-Montrachet was the second vintage from d’Auvenay following the purchase from Jean Chartron. It felt fully mature on the nose, perhaps a little muted compared to subsequent vintages, impressive in weight and presence though clutching at straws for a moment, I feel that the growing season erased some of the mineralité and tension it would otherwise convey. Maybe it is just a few years past its peak? 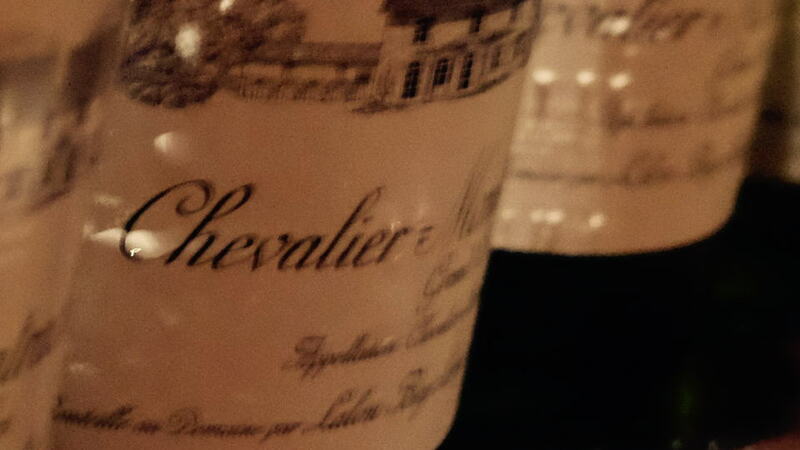 The 1999 Chevalier-Montrachet is where things got serious. The nose was utterly ethereal with a cheeky scent of freshly baked popcorn and a subtle reduction, the palate incredibly tensile and saline with hints of yellow plum on the finish. The length beggared belief. If you own any of the other 813 bottles, then I am insanely jealous. The 2002 Chevalier-Montrachet is one of the greatest white Burgundy wines that I have ever drunk. It encapsulated everything magnificent, everything profound about white Burgundy, the kind of wine you tell your children about. “Liquid minerals” is the expression that best sums up the spectacular aromas that exploded from the glass. The palate was so razor-sharp that you almost felt humbled in its presence and the manner in which it fanned out on the finish is difficult to describe in words, which admittedly is an obstacle when you are paid for them. To my knowledge I have never given a perfect score to a bottle of white Burgundy but this came damn close. Then along came the 2005 Chevalier-Montrachet and this cruised at the same awe-inspiring level. I wish I could capture the aromatics in a phial so that the next time someone is bragging about the intensity of their wine, I just open it up and tell them to “sniff this.” Again, the palate was governed by its razor-sharp acidity and just a hint of viscosity on the rich, almost flamboyant finish. The 2002 and 2005 are two reasons why millionaires will pay anything for these wines. The 2006 Chevalier-Montrachet could not hope to match these two, but it was still an impressive wine, more backward than I expected and unlike so many other white Burgundies from this vintage, showed no signs of botrytis. The palate is ripe and generous, perhaps here just a light smear of honey, yet elegant and poised from start to finish. 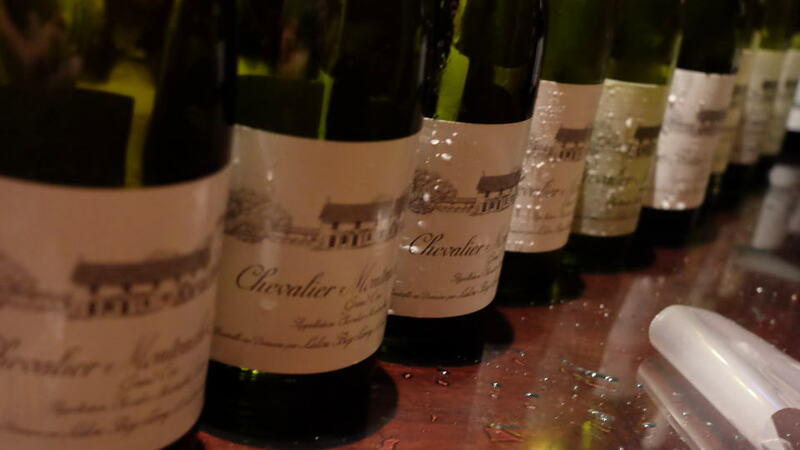 Five Chevalier-Montrachets from Domaine d’Auvenay in one day is surely unprecedented. If truth be told, I did not drink five. I drank six. Earlier that day I visited a friend’s apartment for lunch in the Hong Kong suburbs. While he and his wife prepared their exquisite dishes, I took a glass of Champagne and joined a guest out on the balcony that overlooks the humming forest below. I recognized his name from a couple of wine bulletin boards. I was surprised to learn that he came from the same town as me and, furthermore, we both attended Westcliff High School for Boys. In fact, I used to know his younger sister Emma in the late 1980s. To complete this chain of coincidences, she was teaching at the same primary school with my youngest brother. He told me that he bought a bottle for lunch and I enquired what it might be. “Oh, a 1996 Chevalier-Montrachet from d’Auvenay,” he replied. Immediately I am whisked back to that fateful evening in Holland. Turns out that we were fated to meet again. It was pure coincidence that he had proffered this bottle on the same day as the d’Auvenay dinner. An hour later and the 1996 Chevalier-Montrachet was poured into my glass. There was a weight of expectation tinged with sentimentality. Would it tarnish my cherished memories? Not in the slightest. After two decades, the 1996 was still a startling mature Chevalier-Montrachet, resinous and waxy on the nose, yet with ineffable precision and persistence in the mouth. It might be reaching the end of its plateau – but what a wine. Why am I telling you this story? Well, I am aware that the subject of this article is beyond the means of all but a handful. Unfortunately, there is nothing I can do about that except pen some words that hopefully offer vicarious enjoyment and objective appraisal. The Chevalier-Montrachet from d’Auvenay is an extraordinarily rare and expensive wine. However, it will always be the wine that opened my eyes to White Burgundy. Reacquainting myself with that 1996 over a casual lunch, I silently rejoiced that this bottle was not gathering dust in some collector’s cellar as a museum piece, just like the plethora of d’Auvenays opened later that evening. For my old Essex mucker and Mr. d’Auvenay alike, their motive was not to boast or preen, but share these bottles with appreciative friends and provide a unique opportunity to place them in context with other vintages and vineyards. The moral of the story is that it does not really matter what is in your wine glasses when you clink them together, as I did many times that day. It is who you clink them with that really matters.